We could write about who we are at The Oaks at Bethesda all day long. We could tell you what it’s like to sit in our dining room on a rainy day, a perfectly melted grilled cheese and steaming bowl of tomato soup in front of you. We could talk about the time we had our own Oktoberfest, complete with bratwurst, beer, and lederhosen. We could reminisce on the memories we’ve made during trips into town, at our cookouts and car shows, or the fun we had during our annual Grandparent’s Day Sleepover. But if there’s one thing we’ve found out, it’s you should experience all for yourself. We built The Oaks at Bethesda on a foundation of family values: compassion, honesty, respect, and above all, service to others. For over 20 years, we’ve been connecting with people across the Midwest who share these values. Many of them have become Trilogy employees, and many more have become valued residents. We take pride in treating all of them like family. When you choose a Trilogy Senior Living Community, you can count on us to serve you according to our values, and to uphold those values with standards you can depend on. That’s The Trilogy Difference. You’ll feel it the moment you walk through our doors, and you’ll see it everywhere you look. It’s what makes every Trilogy Senior Living community a choice you can be proud of. Don’t wait. 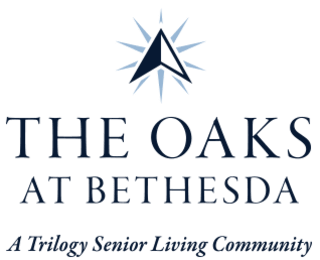 Schedule a tour of The Oaks at Bethesda today.